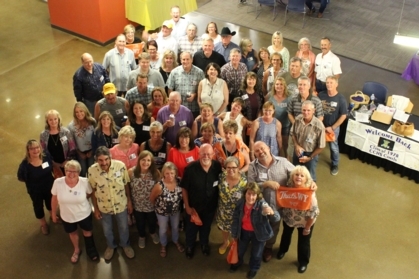 The Class of '78 Reunion Committee can't thank all of you enough for attending our recent reunion, sending messages, updating profiles, posting pictures and staying in contact with us and others from our class. The 40th was the best reunion yet...so much fun, so much laughter, so many hugs and smiles. Everyone missed those who couldn't attend! We embraced the idea that each of us have a connention and a common bond...we're CAMELS and we're the class of '78. Whether you knew each other from a class, athletics, drama, music, shop, a club, lunch, the parking lot, elementary school, jr. high, or you recently became acquainted because you attended the reunion and sat at a table with someone new....we all belong! It has been requested that we don't wait another 10 years to get together, so we'll shoot for 2023! We're pretty certain there are going to be quite a few "mini" reunions as well. The committee requests that we all stay in touch, use this site to communicate (as many aren't on FB), keep your email addresses and profiles up to date, and continue to post pictures. Take advantage of the message forums and easy access to email classmates! We support each other, we know how to have agood time, and we certainly proved the Class of '78 is still great! 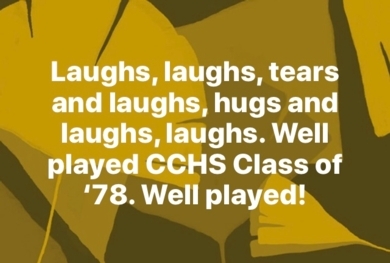 Comment from '78 Class member....Perfect! There are new photos added on the site from the reunion. Click on "40 Year Reunion Pics" button on the left side on home page. There are several galleries from the entire weekend...will be adding a few more and updating names soon! Thanks to those who shared pics to use on the site! Great memories!!! A huge shout-out to Brad Andrews and crew for painting the Camel during the reunion! We forgot to mention that publicly on Friday night of the reunion and we sure appreciated all the effort...great job! Thanks to Brad and Rick Baker (and anyone else) for sharing pictures! '78 is THE BEST! Be sure to check out the "In Memory" Page and "Message Forum." Classmates are remembering our friends who have left us and they have a great discussion about the reunion!